I, like most smokers at one time owned a Zippo Lighter. It was the brand that was the best. It had a nice clean look and felt smooth and solid in the hand. Lighting a cigarette was a pleasant ritual. There are a few who have turned the lighting of a cigarette into an art form. 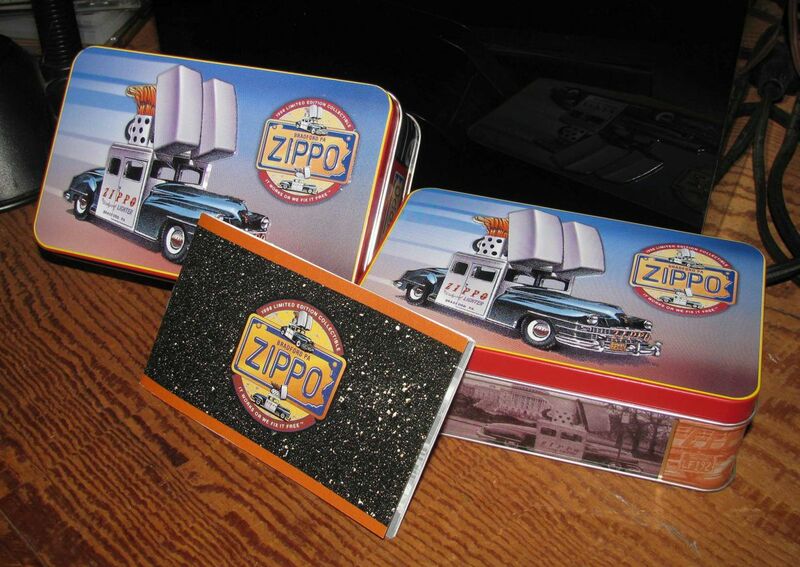 Back in 1998 the Zippo Lighter Car showed up in Illinois, USA at the Elmhurst Cars Under the Stars Wednesday night event. It was a powerful advertising image. It was kind of like the Wienermobile except that it promoted a vice. What was not to like about it? The evening that the Zippo Lighter car showed up was probably the only time in the last twenty years that I left the house with out a camera. Though the show ended with out me getting any photographs, I did leave with some souvenirs. Not getting any photos has haunted me all these years. It against an original photo from 1947. 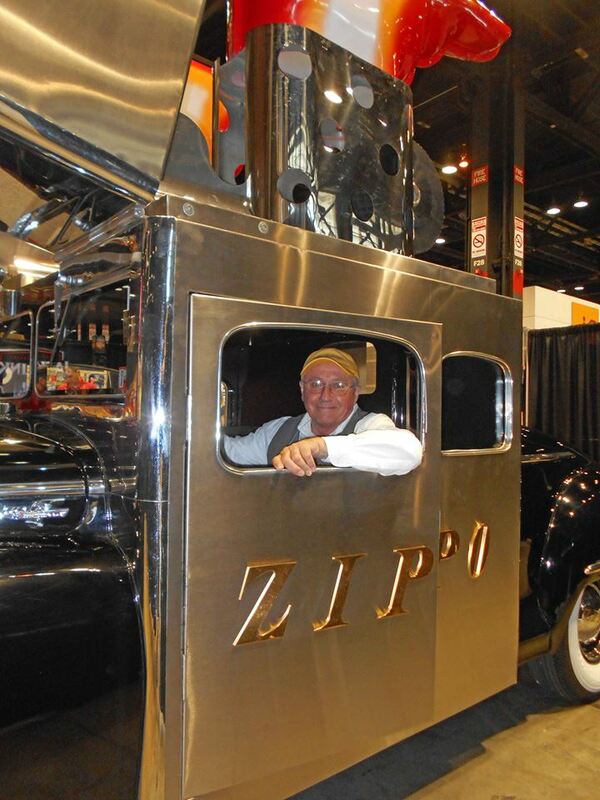 This summer I received an Email from Dave Nevers from the Greater Illinois Region of the Classic Car Club of America informing me that the Zippo Car would be at McCormick Place in Chicago at the end of August. Dave has an innate need and ability to dig deep for car stories. He can be counted on to search the internet for small but also very interesting stuff. The Zippo Lighter Car was now in my sights. 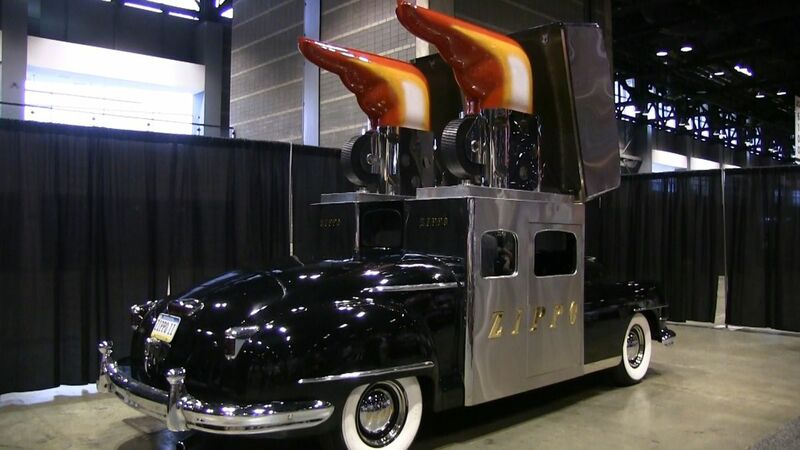 It was the Ace Hardware convention at McCormick Place that the Zippo car was being brought to. I find myself going to McCormick Place quite often. Many trade shows are open to the public and you never know what kind of magic is going to appear. With the knowledge that the car was coming to Chicago I found the Zippo website and made contact with the Marketing Coordinator, Andrew Beck. I made sure that Andrew knew that driving shots of the car were important to me. We were to meet at the hotel where the Zippo people were staying the day before the McCormick Place event. I waited for the email that they had arrived in Chicago. And I waited. Somewhere along the way on the drive from Pennsylvania the transmission on the tow vehicle went bad. They arrived very late and only had time to get the car into position in the Zippo display in McCormick Place. I suggested getting my driving shots in McCormick Place as they were unloading the car and driving it to their booth. Apparently security there does not allow for these kinds of transgressions. On the opening day I arrived early and met Andrew. I received my pass and we made our way to the car. At last, there it was. This wasn’t the original car. 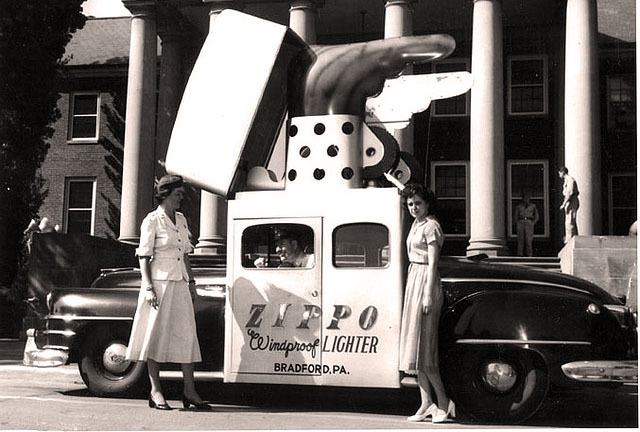 The first Zippo car was built after WWII to take advantage of the good will that Zippo earned during the war. The first car had been driven into the ground with all of it’s national touring. The weight of the super large lighters caused the car to have many tire blow outs. 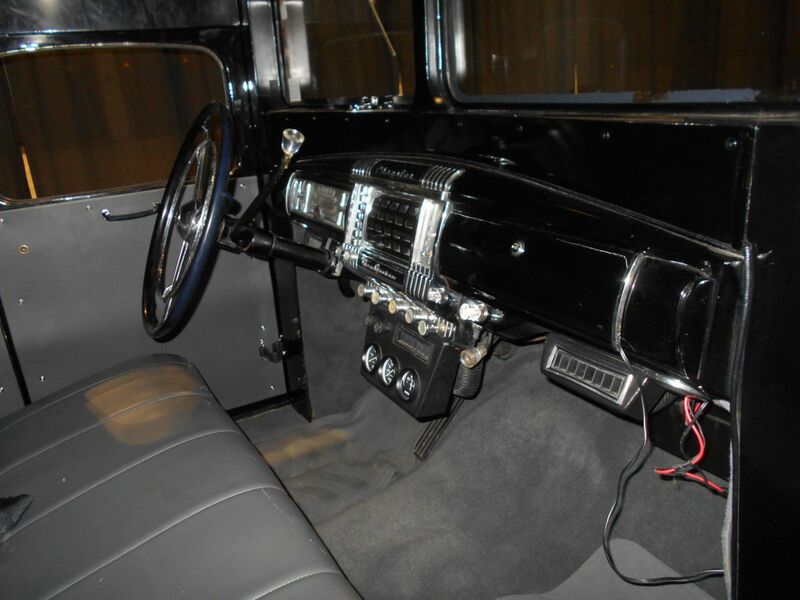 When it was completely worn out it was taken to a Ford dealer in Pittsburgh, Pennsylvania for renovation. The estimate for repairs was a lot. So high was the estimate that the car was left at the dealership as interest in the rebuild went cold at Zippo. After some time Zippo went back to the Ford dealer. The dealership was gone, out of business. The worn Zippo car was also gone. 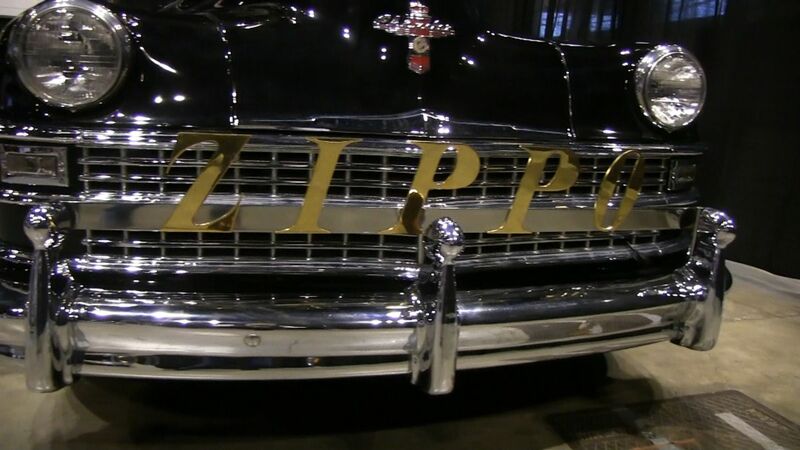 In 1996 Zippo got back into the game with a new and improved Zippo Lighter Car. 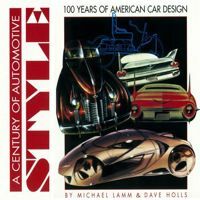 The new version started as a 1947 Chrysler New Yorker Saratoga. It is lighter and stronger than the original and this one is trailered. For travel the flames are removed and somebody has to get on a ladder to close the lighters for travel. I had kind of hoped there would be some hydraulics or electric motors to close the lighters for more interesting video but Zippo went for reliability, human power. As a YouTube video project it went well. I feel like I might be one of the luckiest people on earth for the vehicles that I get rides in. But yes, no ride in this one. 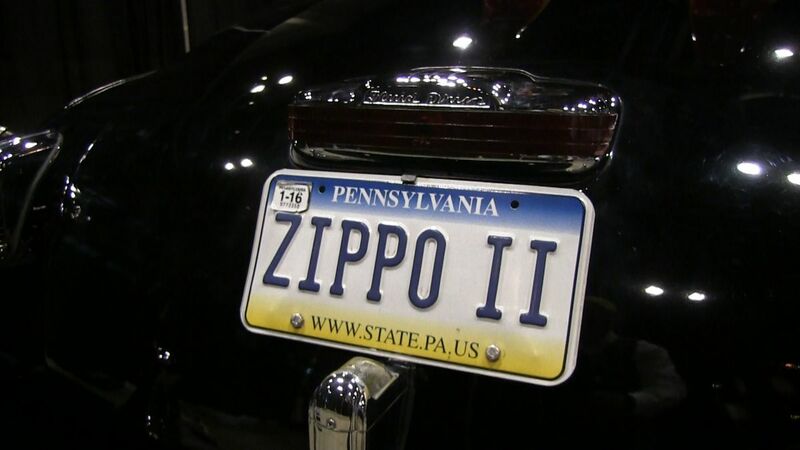 Zippo has a museum in Bradford, Pennsylvania where if the car is not touring it can be seen. The next time that I am in Bradford I will stop by and say Hi. Maybe then I will get a ride. It is important in life to have stuff to look forward to. 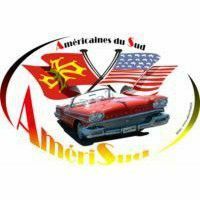 Credit VidÃ©o, Photos : Copyright @ 2015 Chuck Derer. 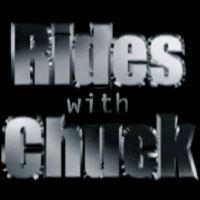 The YouTube channel of Chuck Derer "Rides With Chuck". Let's go for a ride ! 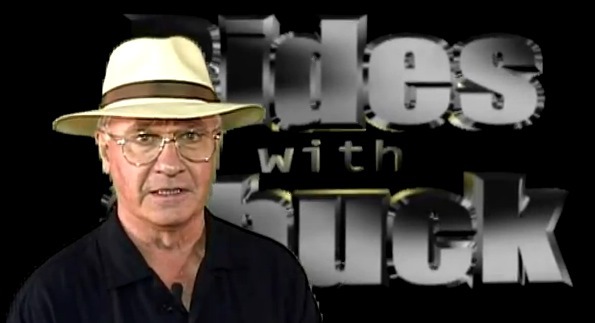 The Blog of Chuck Derer "Rides With Chuck". Just for photos !